Some people view the digital revolution as being just a little over 50 years old – but the fact is, today's most powerful computers are the result of decades, centuries and even millennia of development. At the beginning of the story, you could argue, we humans counted with our fingers, and from that clumsy process the Intel Core i7 was eventually born. To explore the genesis of the computer we set ourselves a task. We wanted to warp back to the very earliest days of computing and track our way through to today. As we walked through the ages, we wanted to identify the most influential computers – machines that shifted the course of computing forever. So, come with us as we visit the most influential computers ever made. OK, so the abacus was hardly a computer, but we really can't start our journey anywhere else but here. This ancestor of all mechanised computing aids was first used in Samaria and dates back to before 2,000 BC. A variant is still in use in the Far East today. While all fell short of what we'd now consider a computer, various arithmetic devices were introduced over the next the two millennia, some of which remained with us until the 20th century. One abacus descendant is the slide rule. This was an analogue calculating device based on logarithms, and it was famously used by a bunch of boffins in the 1950 BBC election broadcast to calculate the swing as each result came in. The mechanical adding machine, on the other hand, was a common piece of office equipment until it was replaced by the electronic calculator in the 1970s. An abacus, a slide rule or an adding machine could each be used to perform a single calculation. Babbage's Difference Engine was quite different. It was intended to perform a series of calculations. Designed between 1847 and 1849, it was never actually built in Babbage's lifetime. In 1991, however, the London Science Museum built a model to Babbage's original plans. It worked perfectly. Although it was a purely mechanical machine, driven by a crank handle and containing cogs, gears and levers, it accurately calculated and printed tables of polynomials that were used for astronomy and ballistics. Next came Babbage's steampowered Analytical Engine. Unlike the Difference Engine, which was designed to perform a particular type of computation, the Analytical Engine was a programmable or universal computer in just the same way as today's PCs. Indeed, programs written for it by Babbage's contemporary Ada Lovelace bear an uncanny similarity to modern computer programs. Add all this up and you could argue that the Analytic Engine represents a more significant step than the Difference Engine did. The problem was that the Analytic Engine was never built by anybody, and so the machine remains largely untested. 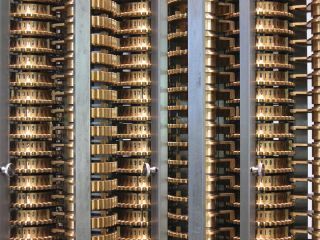 The first completely electronic computer Like Babbage's Analytical Engine (which is best described as a calculating machine), Colossus was a proper computer, albeit one that was designed to perform one very specific type of calculation. Where it broke new ground was that, for the first time, it was purely electronic. Created by Tommy Flowers and his team at the Post Office Research Station in 1944, it was used at Bletchley Park as part of the World War II code-breaking effort. While a mechanical computer called the Bombe had been adequate to crack messages encrypted using the famous Enigma machine, the more complicated German Lorenz cipher machine that was used to encode teleprinter traffic required the increased speed of an electronic computer in order to break the code. Colossus contained no less than 2,400 valves. With memory being expensive, the data was operated on directly from paper tape. As a result, the speed of the computer depended on the speed of the tape reader. Operating at 40 feet per second (27.3mph), Colossus had a speed of 5,000 characters per second. A rebuilt Colossus is now on show at the National Museum of Computing at Bletchley Park. Designed and built at the University of Pennsylvania under a US government contract, and intended for nuclear weapons research, ENIAC became the world's first 'universal' electronic computer: in other words, one designed to do any job according to its programming. It was completed in 1946, and its headline figures are startling. It contained 17,468 valves, 7,200 diodes, 1,500 relays, 70,000 resistors, and 10,000 capacitors, all held together by about five million hand-soldered joints. It weighed 27 tonnes, measured 2.6m x 0.9m x 26m, and consumed 150kW of electrical power. When translated into today's terms, it set Uncle Sam back about $6million – and that's not including the power bill! Despite being the first universal computer, ENIAC differed in several important respects from its various successors. For a start, it operated on decimal rather than binary arithmetic, something that contributed massively to the valve count – which was huge, given its rather pedestrian performance. More significantly, despite being universal in nature, ENIAC was programmed by plugging patch leads and configuring switches. As a result, changing the machine's configuration from one operation to another was a task that would typically take several days to complete – a far cry from the simple speed of loading a program from disk that we're used to today. The Small Scale Experimental Machine (SSEM), or Manchester Baby, was completed in 1948. It was dubbed Baby in an effort to differentiate the machine from its successor, the Manchester MK1. The SSEM was groundbreaking. Here was a computer that was fully electronic, truly universal and, for the first time, could execute a program stored in internal memory. As it was the first ever stored program computer, we are able to draw some direct comparisons between the Manchester Baby and today's PCs. It had 550 valves (transistors, integrated circuits and microprocessors were still some way off), and just seven instructions, which could be executed at a rate of 700 per second. It had 32 words of 32-bit memory. Although you'd have to put several zeroes on the end of these figures to come close to describing today's PCs, it's fair to say that the world owes a debt of gratitude to SSEM's creators Freddie Williams and Tom Kilburn of the University of Manchester.